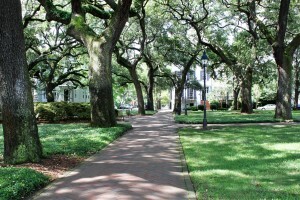 These squares are surrounded by some charming churches, historic homes, enchanting inns and museums and are all shaded by huge live oak trees. On weekends you might see kids running around them with a football, a couple having a picnic in the grass or maybe even a proposal! 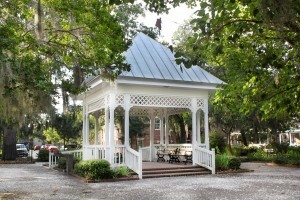 Savannah’s squares are a hot-spot for intimate, outdoor weddings in Georgia’s First City. 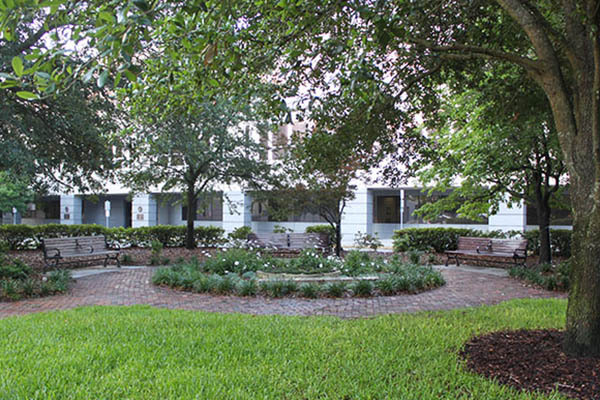 Just two blocks north of the famous Forsyth Park is what was once a retreat for schoolchildren and a bit of backyard for those in the heart of downtown. Located at Abercorn & Wayne Streets. Chatham Square is nestled into a neighborhood on Barnard Street just a couple blocks away from the lively Liberty Street, where hotels and restaurants start to flood the Historic District. Located at Barnard & Wayne streets. 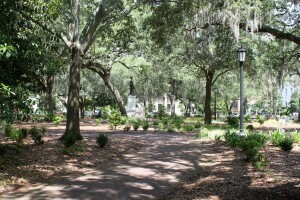 Chippewa Square is one of the most known squares in all of Savannah, right in the center of everything – famous theatres, restaurants and ice cream parlors. Even Forrest Gump has visited this great place. Located at Bull and McDonough streets. 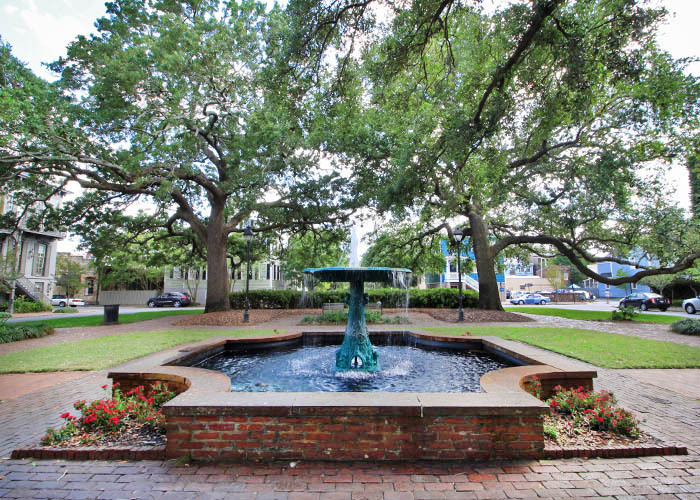 It might be hard to imagine that this small square is in the middle of the bustling downtown streets with its ambient atmosphere and serene fountain, nestled within the northeast quadrant of the Historic District. Located at Habersham and President streets. 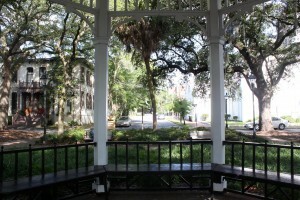 No other square in all of downtown boasts the benefits of a small park like Crawford Square, which not only has a basketball court, but also a gazebo. Located at Houston and McDonough streets. 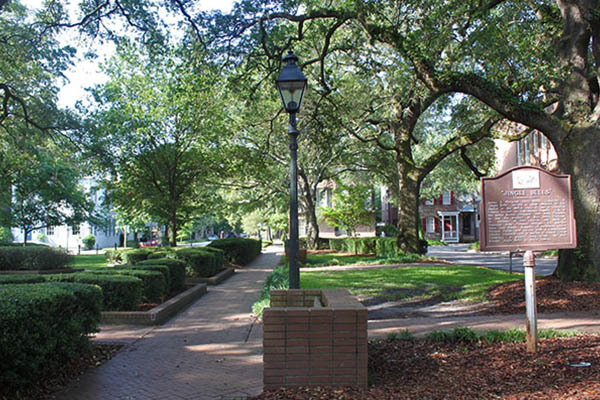 Across from the Savannah Civic Center is a sliver of greenery, known as Elbert Square, which was laid out in 1801 but was paved over in urban development. Ellis Square is the city’s most exciting square, right next to the restaurant- and shop-filled City Market. It boasts a water fountain, shaded tables, a life-size chess set and rentable CAT bikes. Located at Barnard and Saint Julian streets. On the west side of City Market is Franklin Square, right in the middle of the downtown bustle. It’s surrounded by some of the liveliest night scenes in the city, with several bars just west on Congress Street. Located at Montgomery and Saint Julian streets. 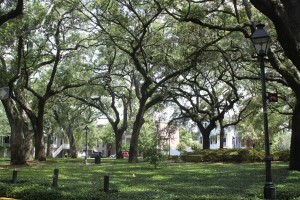 Whether you want to sit on a bench in the park or bring a blanket for a picnic, Greene Square is a great spot to do so. Located at Houston and President streets. 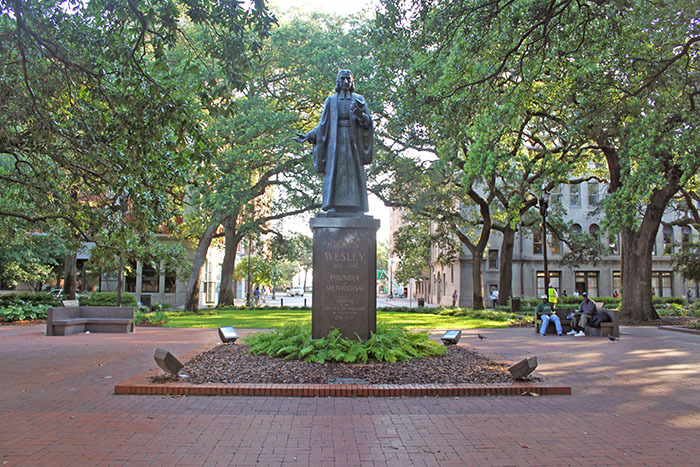 Johnson Square, the oldest and largest square in Savannah, is surrounded by some of the most magnificent buildings downtown, including City Hall, the Christ Episcopal Church and several large banks. Located at Bull and Saint Julian streets. Lafayette Square is home to the ornate Cathedral of St. John the Baptist, which has the highest twin steeples in all of downtown, designed by architect Francis Baldwin. Located at Abercorn and Macon streets. You won’t find Liberty Square if you go looking for it, because it was paved over in construction of the Chatham County Courthouse and the Robbie Robinson Parking Garage. 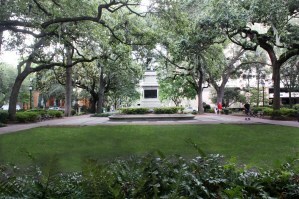 This square, which was laid out in 1799, used to be located at the intersection of Montgomery and West President Street. There’s a plethora of history, and even some rumored hauntings, in and around the Madison Square, as well as a great selection of restaurants and shops. 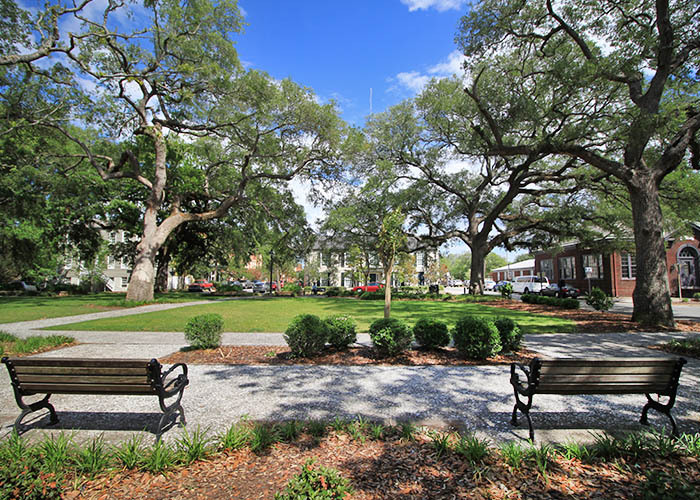 Named after U.S. President James Madison, this square features vintage cannons from the old Savannah Armory. Located at Bull and Macon streets. 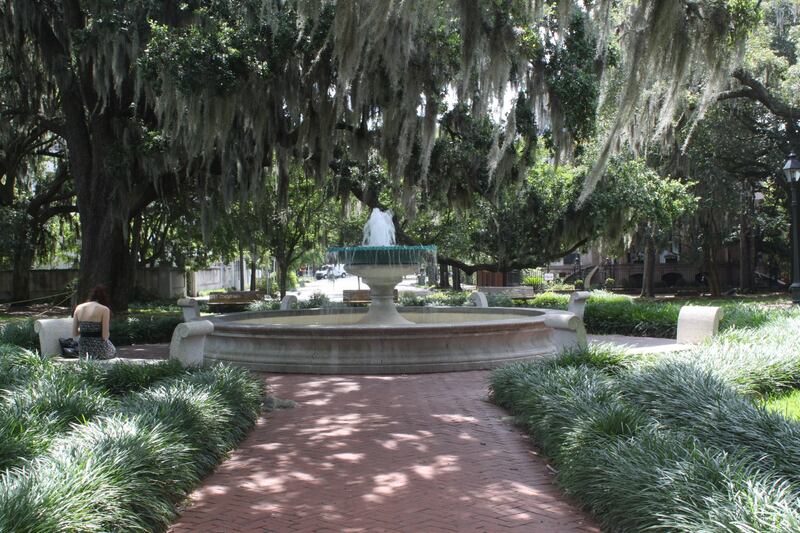 Monterey Square is a shaded alcove that welcomes visitors to pause and check out the towering monument that pays homage to General Casimir Pulaski. 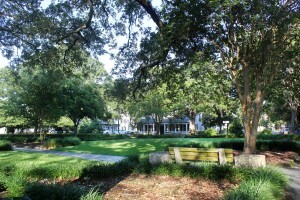 The Mercer House, the setting for the murder in “Midnight in the Garden of Good and Evil,” is on this lovely square. Located at Bull and Wayne streets. 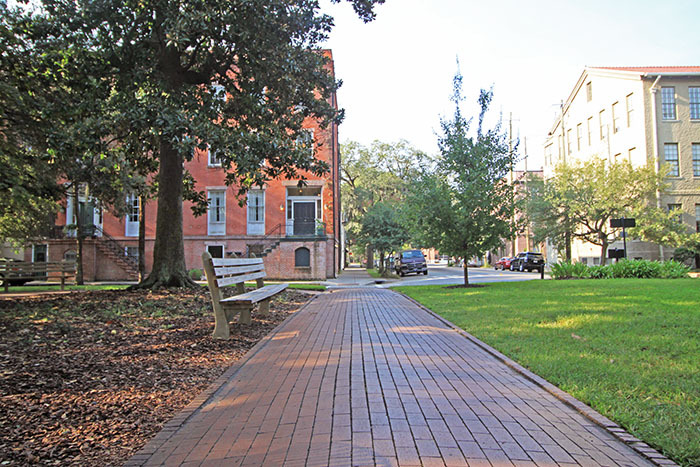 Benches line the brick sidewalk of Savannah’s modest Oglethorpe Square, which pays homage to the founder of Savannah and the colony of Georgia, General James Oglethorpe. 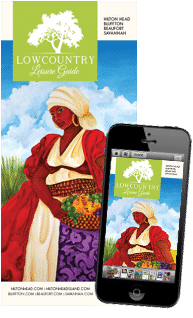 It’s the perfect place to enjoy a picnic lunch or a shady break. Located at Abercorn and President streets. 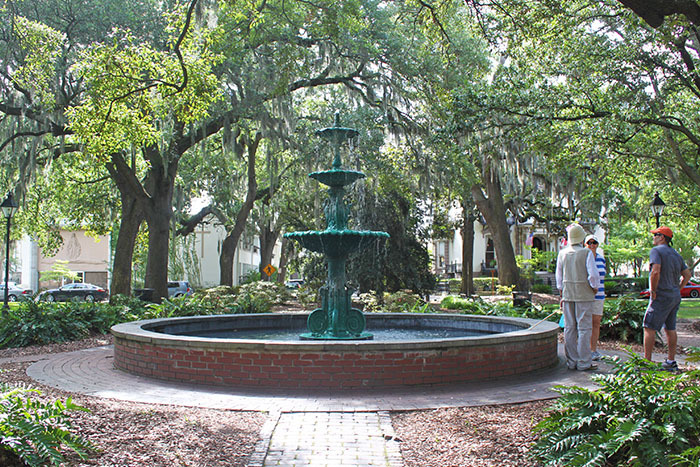 Orleans Square, the backyard to Savannah’s Civic Center and Savannah College of Art and Design’s Oglethorpe House, boasts the German Memorial Fountain. Located at Barnard and McDonough streets. One of the few squares without a monument, Pulaski Square is named for Polish Count Casmir Pulaski, a hero of the Revolutionary War. 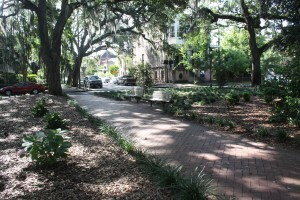 This square features some of the most beautiful live oaks in the city, as well as thick ivy groundcover. Located at Barnard and West Macon streets. Reynolds Square has some of the best company in town, with The Ole Pink House, Lucas Theater, Leopold’s Ice Cream and Trustees’ Theater next door. Whether it’s musicals, movies, fine dining or desserts you’re into, they’re all right around. Located at Abercorn and Saint Julian streets. 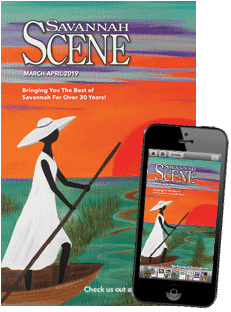 Some might say that Telfair Square is backyard for art because of its location next to The Telfair Academy and Jepson Center. 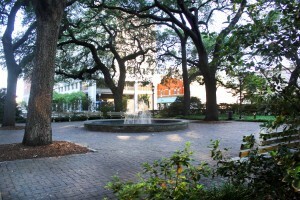 The square, once known as St. James Square, was renamed because of the Telfairs’ contributions to the city and culture of Savannah. Located at Barnard and President streets. 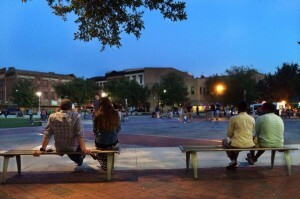 Troup Square may be one of the smaller squares, but it’s not a drop less brilliant! 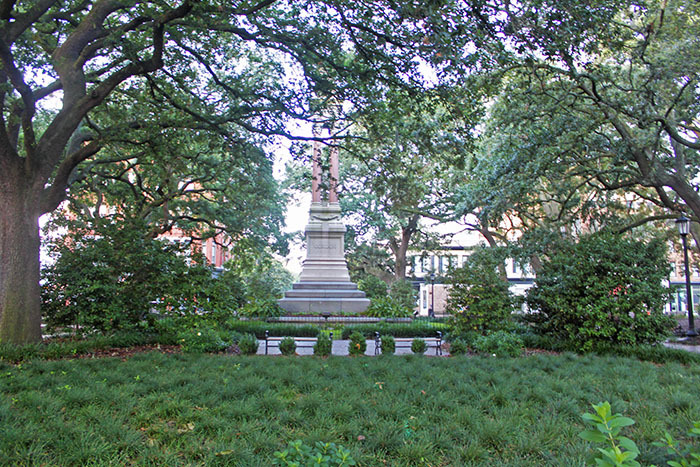 In it is one of the most fascinating monuments in all Savannah’s squares. And it’s the perfect place to take your furry pal, because there’s a fountain there just for them! Located at Habersham and Macon streets. 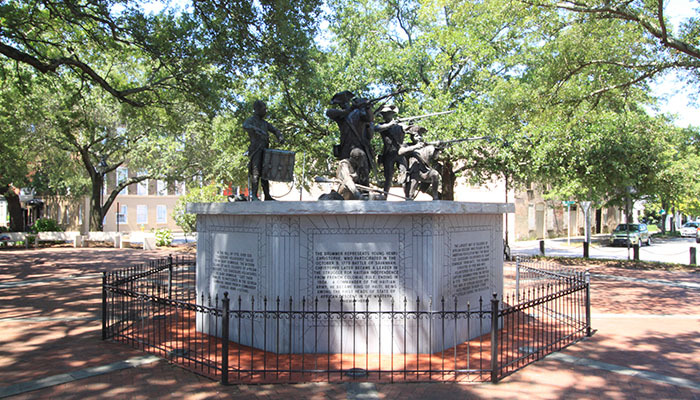 This little neighborhood square, which was named in honor of Revolutionary Ware hero General Joseph Warren, is shaded by huge Live Oak trees and tucked between West Bryan and West Congress streets, located at Habersham and Saint Julian streets. What was once the site of the Trustees’ Garden is now the ambient Washington Square, where visitors can sit and sip wine or take a stroll through. 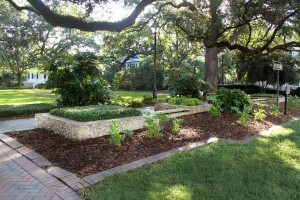 At one time it bordered the original Trustees’ Garden, where colonists grew a variety of experimental crops. Located at Houston and Saint Julian streets. This quiet little square is secretly one of the best, with its Victorian gazebo and azalea flowers. It’s a popular place for weddings, hosting countless marriage ceremonies over the years. Located at Habersham and Wayne streets. Wright Square has two of the most impressive monuments in all of downtown – a towering statue and an enormous boulder and they have quite a story. Located at Bull and President streets. 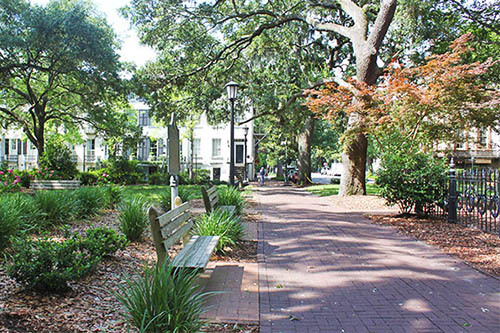 And if you think the city squares in Savannah are great, then be sure to check out some even bigger plots of beautiful greenery in the city – the great parks in Savannah!